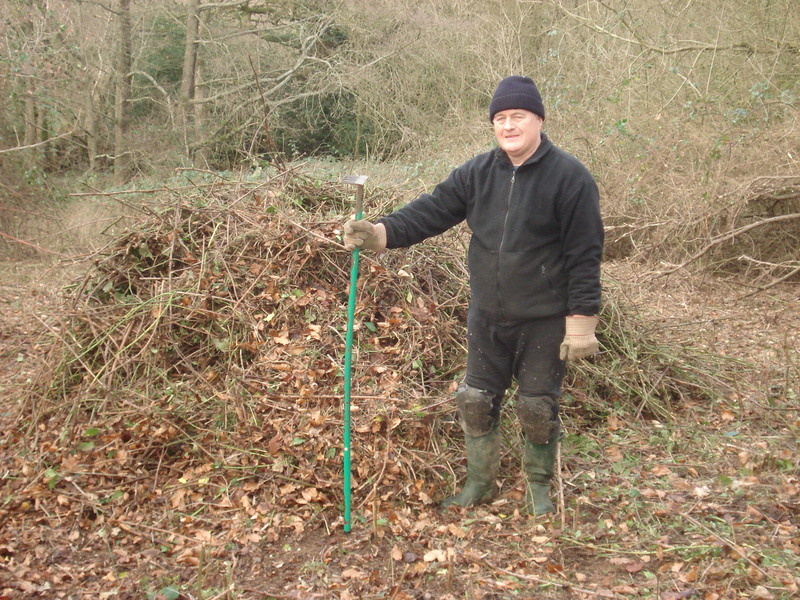 It’s turned quite cold, but still it’s not raining or snowing at the moment, so Neil has taken the opportunity to go down the woods and continue with clearing the bramble patch. 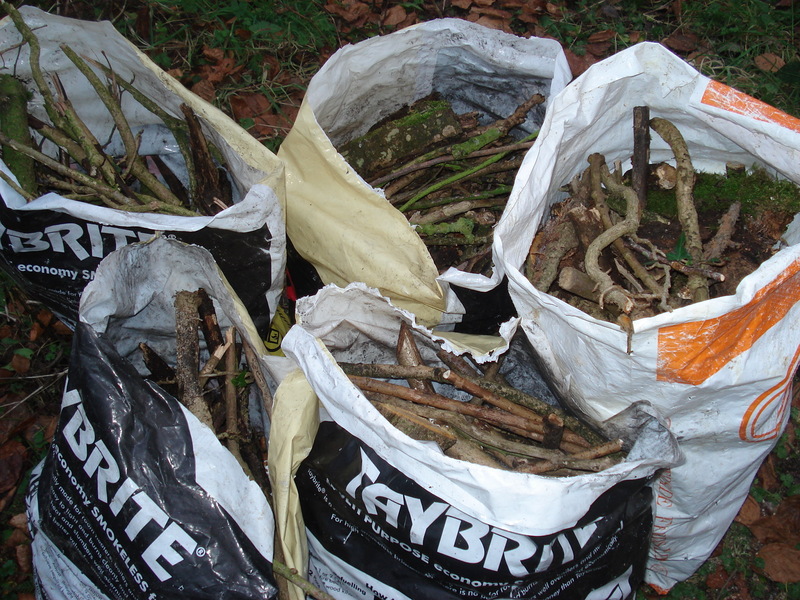 He made a big pile of brambles ready for burning. 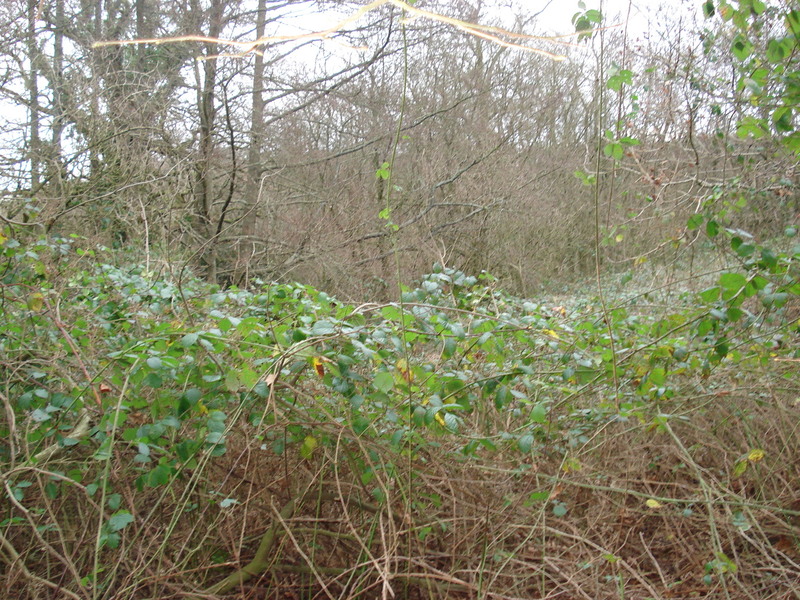 And yesterday he decided to light the bonfire and get rid of these brambles. 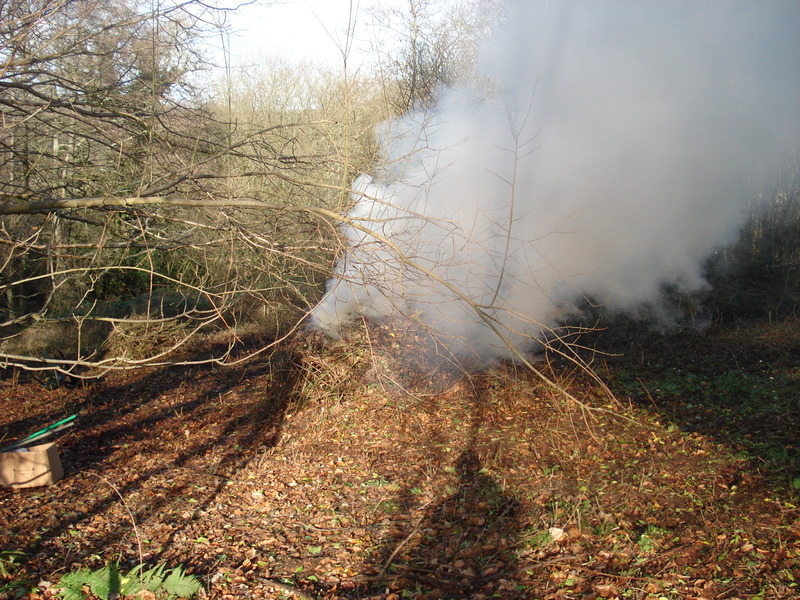 The wind was a bit all over the place so the smoke did blow around rather. 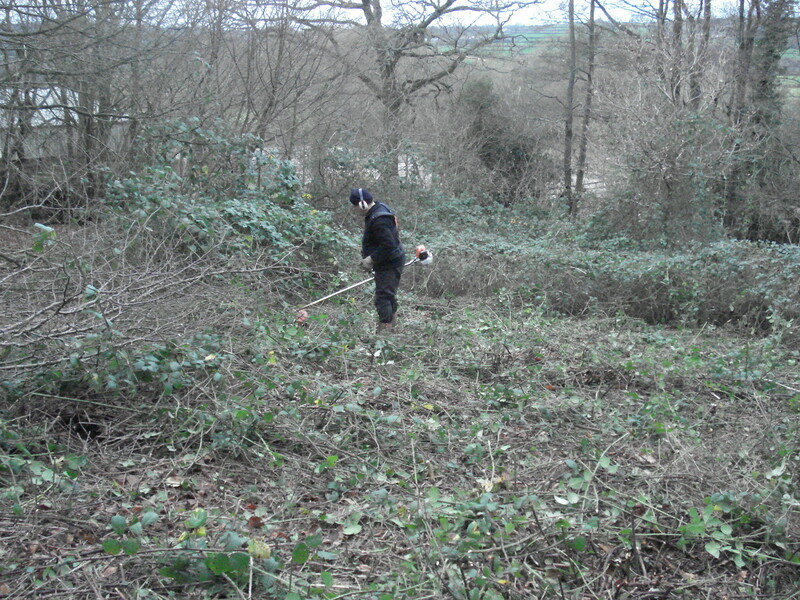 There was a dead elderflower tree in the patch that Neil is clearing so he had that down yesterday. 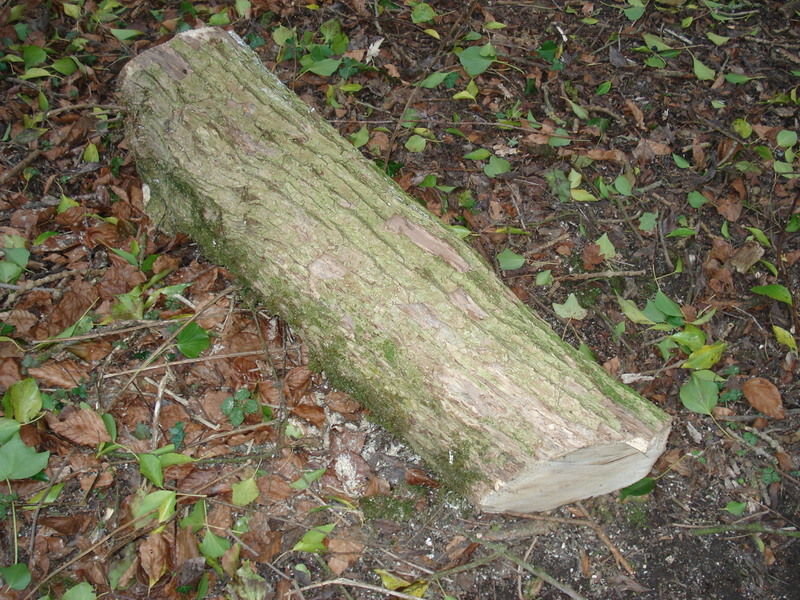 There are some quite big logs which when cut up, split and dried out will make great firewood. Unfortunately I have gone and got the first cold I have had in 2 years since we moved here, so I have not been outside, but stayed in the warm and am cooking up a nice beef casserole for dinner. Good job we don’t have any B&B guests at the moment as I wouldn’t want to be sneezing in front of them!! One of our Black Rock hens has died. I went down to let the hens out of the hen-house early this morning and there was a lot of commotion in the hen-house. 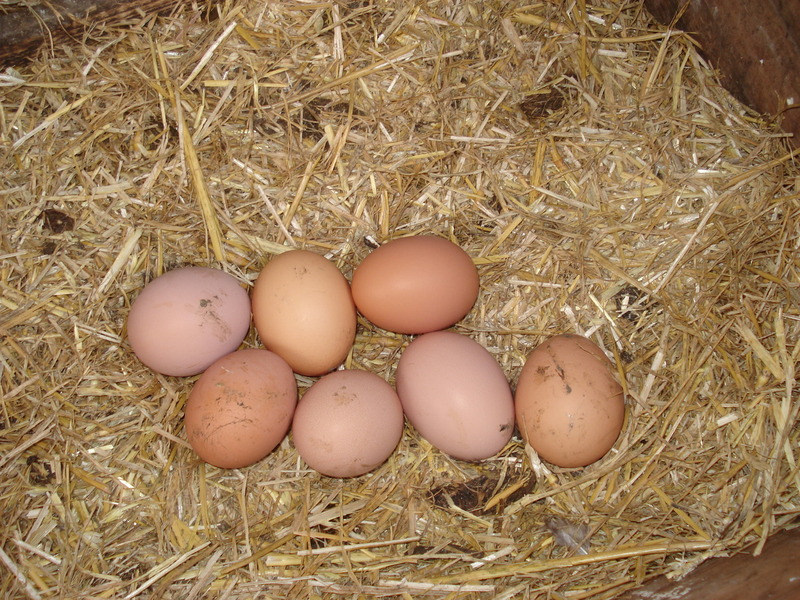 They all came tumbling out except for one hen who was lying in the straw in the nest box. I could see from how awkwardly she was lying that there was something wrong. 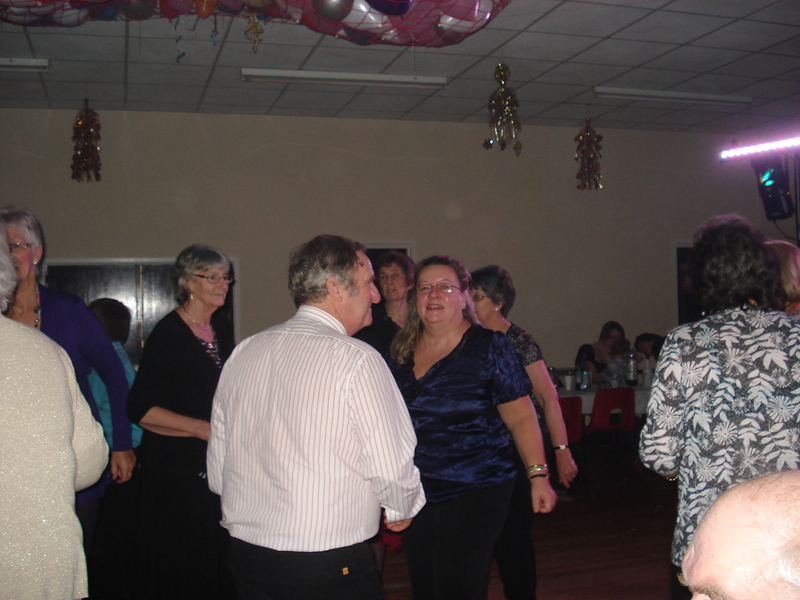 When I touched her I realised she had died in the night. This particular Black Rock had lovely markings with a gold necklace of feathers round her neck. 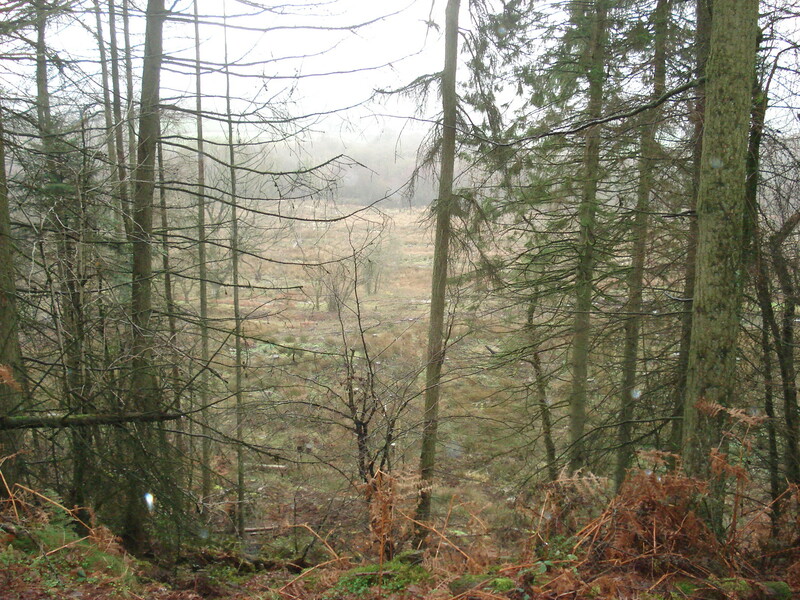 But she had been poorly for some time, she would stand there all hunched up and not interested in food. When we threw corn all the others would come running and she would just stand there taking no notice. Nor was she laying any eggs. 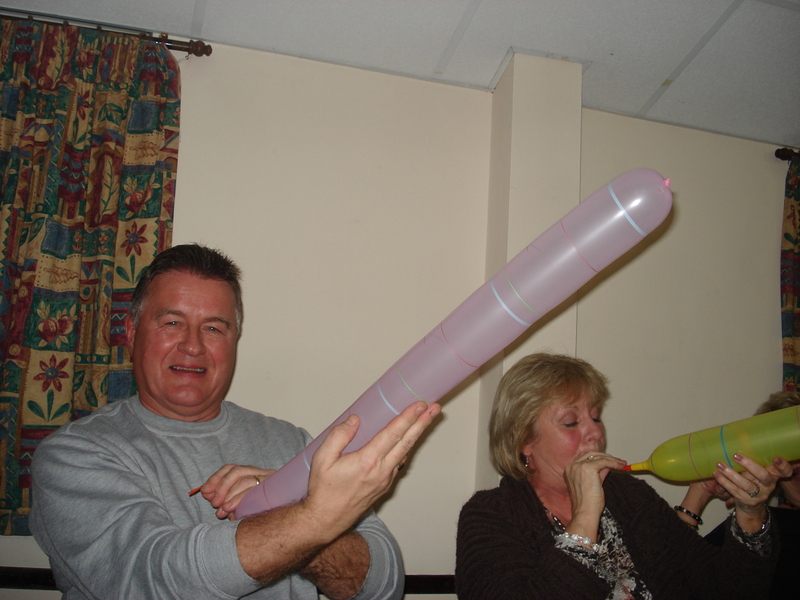 There’s not much you can do when a hen is poorly. Taking her to the vets would be prohibitively expensive and not worth it for the cost of a chicken. That may sound a bit harsh, but they are not pets, they are here to produce eggs. So now we are down to 15 hens. 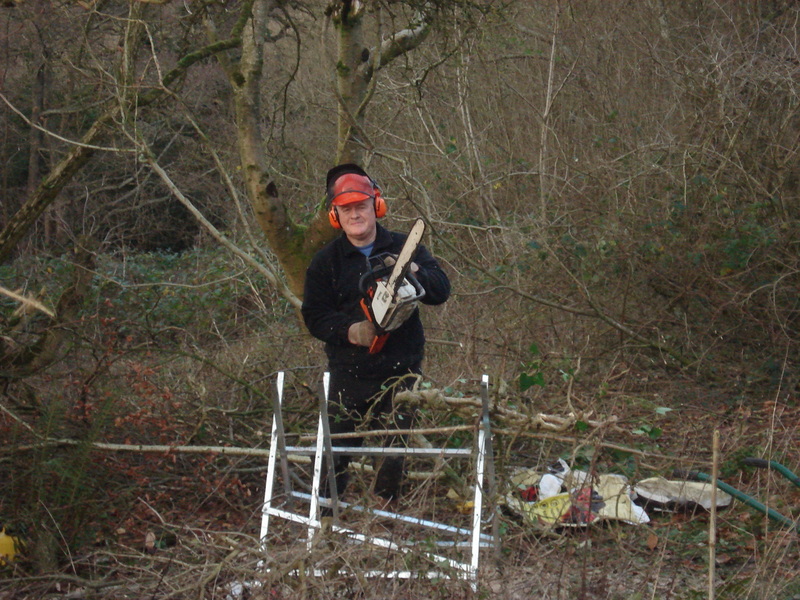 Neil removed the body from the nest box this morning and took it down the woods for the “fox removal service”. All just part of nature’s food chain!! Now the nest box is clear and the others can get on with laying eggs. 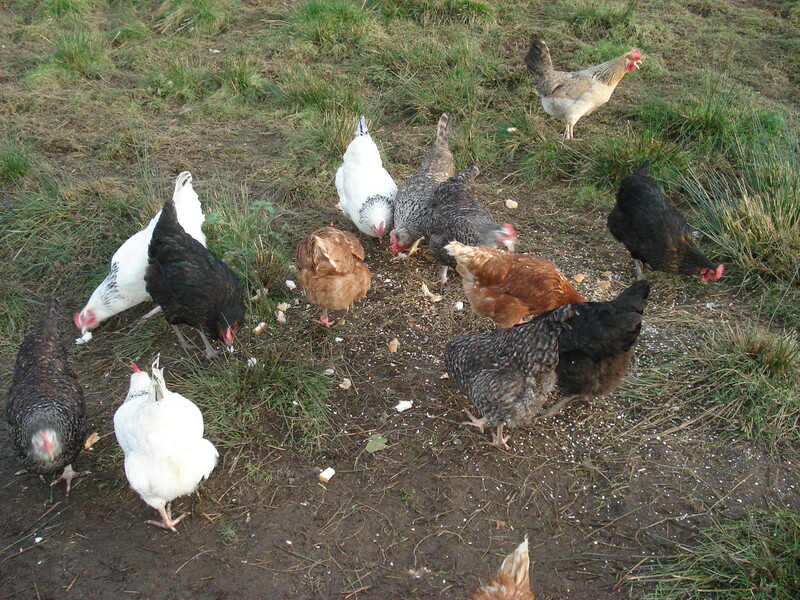 So when we get some lovely guests for our B&B in Buckland St Mary, they will have fresh eggs for breakfast. The hens are a funny bunch. 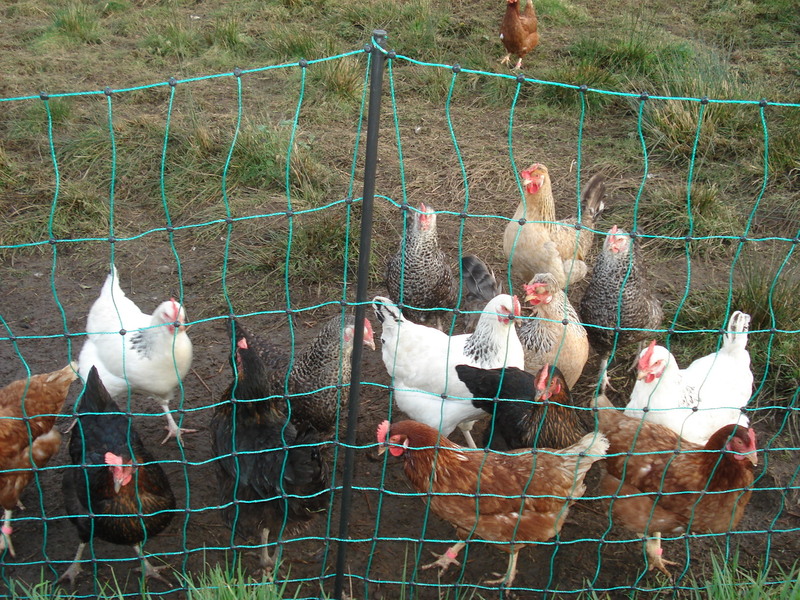 We have conditioned them like Pavlov’s Dog, so that when they hear our feet on the gravel outside the back door, they think it means we are coming to see them with food and they rush down the field, wings flapping, running madly and wait at the fence edge nearest to us. At lunch time we throw them bread and corn and they go mad for it, especially the bread. They pick up one piece and run off with it, so none of the others can have it, eat it , and then come back for another piece. When all the bread is gone they start on the corn. They have “layers pellets” on free demand 24/7 in the hen house, so they can get those at any time. Unfortunately they poop in the nest box too, so we have to clear the poop out everyday, but sometimes the eggs are a bit dirty on the outside. We get all shades of brown, including pinky brown, and then one white and one blue from our 2 cream legbars. 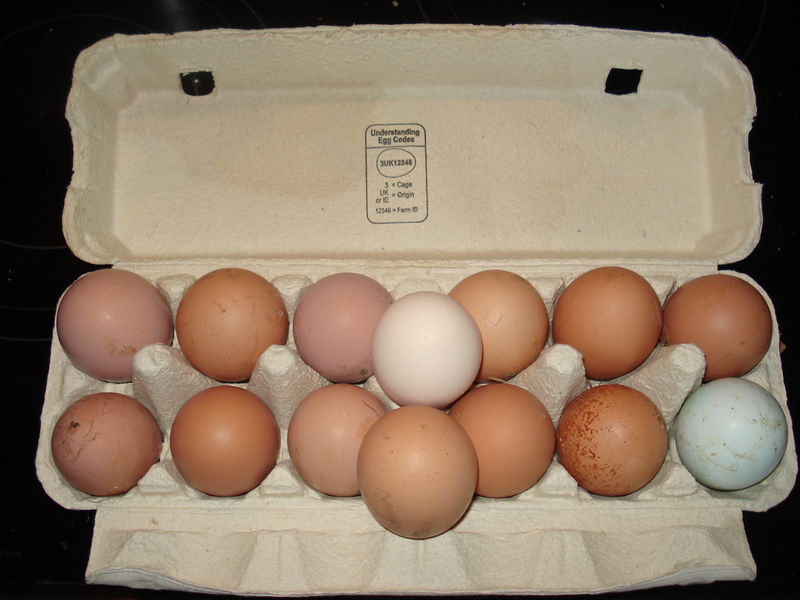 All these lovely eggs for our B&B guests’ breakfasts. Today we got 12 eggs from them, but the other day it was 14 which is our record from 16 hens. I love going down to the nest box and peering inside to say what they have laid us. 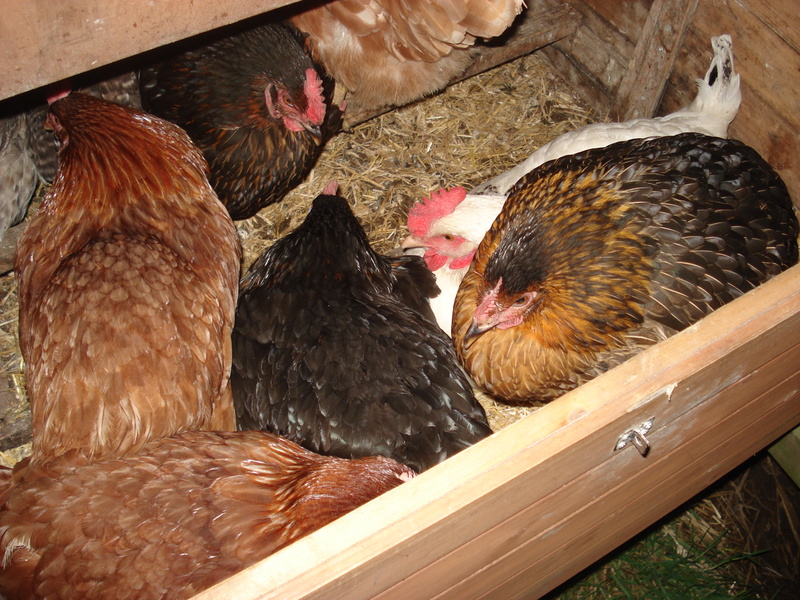 The other funny thing about the hens is when they to go to sleep. They take themselves up into the hen house at dusk and we have 4 perches in there for them. But they don’t stand 4 to a perch, they huddle up together and some go in the nest box and about 7 squeeze together on the first perch and the rest behind. I think they huddle together to keep warm, but they do look funny.